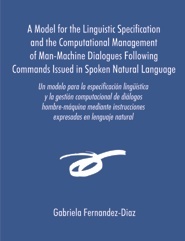 This thesis dissertation, written in Spanish, presents a new model for the linguistic specification and the computational management of man-machine dialogues following commands issued in spoken natural language. Our aim is to design and implement a conversational system for the automatic telephone task scenario, namely Delfos. Voice dialing represents a current trend in research, the purpose of which is to provide functional systems for products ranging from domestic appliances such as a video or a washing machine to more sophisticated environments such as a complete house, with an interface in spoken natural language. Our system, Delfos, represents a challenge for the fields of Language Engineering and Computational Linguistics as it implies the integration of different technologies such as voice recognition, natural language processing, dialogue management, natural language generation and speech synthesis. The present work belongs to the field of Dialogue Management Systems (DMS), that is, computational systems capable of interpreting natural language. A system with these characteristics manages dialogues between people and machines trying to perform different tasks in a preestablished domain (for instance: travel route planning, bank transactions, phone services, etc.). Research on DMS must be placed in the broader scope of Natural Language Processing (NLP) or Knowledge Engineering. NLP has to do with the formalization and automatization of natural languages. The study of DMS is centered on the analysis of the characteristics of language at the discourse level and which must be taken into account when implementing real and natural systems. Thus, the field of “discourse analysis” and its subfields (pragmatics, dialogue acts, discourse analysis…) represent the starting point in the design and implementation of these kinds of system. Those phenomena characteristic of discourse and conversation such as conversational turns, anaphoras, ellipses silences, repairs, overlappings… are all aspects to be considered by the dialogue management system designer. By doing research in this field we are contributing to the enhancement of our linguistic and computational knowledge of the dialogue for those applications which are a key factor in our present information society. In this sense, and with potential users in mind, we will contribute to improve the use, functionality and success of these information services and products. Delfos, and TeleDelfos – a specific application for the automatic telephone scenario task – constitute our main contributions to the field of NLP. Most conversational systems implement only one level of discourse management, which comprises all the modules needed for the specification and management of dialogues, whereas we understand discourse management as an intelligent activity where experience, knowledge, ability and training play crucial roles. Consequently, we are aware of the necessity of applying Language Engineering methods when it comes to implementing DMS. In this sense, Delfos architecture, following the principles of Language Engineering, makes a clear distinction between the level of representation and the level of reasoning. The level of dialogue representation follows the principles of semantic power, declarativity and conceptual proximity, thus making easier the specification for discourse models. Delfos incorporates its own language for the specification ! of dialogue structures. This language allows us, for example, to represent the dialogue history, to control the dialogue expectations, to take control of the dialogue or to leave the initiative in the hands of the user. The knowledge base of this expert system is constituted by the declarative specification of dialogue states, while the problems to be solved by the inference engine are received from the NLP module in the form of complex feature structures (following the Lexical Functional Grammar paradigm). The level of reasoning is viewed as an inference engine specialized in discourse management systems. Thus, discourse management constitutes a generic and independent module, which does not depend on any application, domain or task. These inference strategies ensure, on the one hand, the declarativity of the specification model, the efficiency and success of the system and the robustness, adaptation, reusability and maintainability of the application, and, on the other hand, they differentiate Delfos from any other discourse management system of its kind.